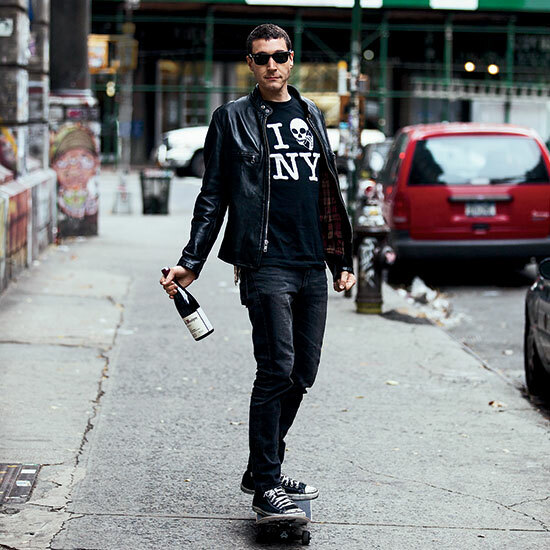 At New York City's Pearl & Ash, wine director and managing partner Patrick Cappiello can often be seen whacking the tops off Champagne bottles with a saber. He also oversees a cellar full of extraordinary values. At New York City's Pearl & Ash, wine director and managing partner Patrick Cappiello can often be seen whacking the tops off Champagne bottles with a saber. He also oversees a cellar full of extraordinary values. Here, he tells how anyone can find bargains on a wine list. Q. Let me get this straight. You quit your job at an ultra-high-end, two-Michelin-star restaurant tohelp open a wine bar on the Bowery? A. Pearl & Ash is the kind of place where I've always wanted to work. I'm a downtown guy; I have a lot of tattoos. Although I did start off as a middle-class kid from the suburbs, who grew up on a skateboard, went to college and majored in philosophy… but even back then, if I could have designed the perfect job scenario, Pearl & Ash would have been it. Q. What inspired the wine list? It's both eclectic and very well priced. A. If you go to Paris right now, the wine scene is very much focused on places like ours. Le Chateaubriand, Spring, Le Verre Volé: They're casual, they're mostly in the outer areas, your server will be wearing jeans. When I was in Paris two summers ago, I went to all these places, and it was incredibly inspiring. Q. Wine prices in restaurants often seem very high. How can people know if they're getting a good deal versus getting ripped off? A. Boy, I could make a lot of enemies here! But generally speaking, industry standard is about twice the retail price. At Pearl & Ash, our markup is lower, more like 50 percent above retail. We're making just enough money to keep the lights on and the water running. Q. What's the best way to find values on any wine list? A. Do your research ahead of time. A lot of restaurants post their wine lists online these days. If you're looking at a particular wine on a list, you can use a site like wine-searcher.com to see what the wine sells for at retail, then calculate the restaurant markup. Q. That sounds like a lot of work. Is there an easier way? A. You can look for regions that are exciting for values. Right now I think the northern Rhône can be great. For instance, this young Japanese guy named Hirotake Ooka bought a property in the Ardèche a little while back called La Grande Colline. He's got a Syrah that's $40 on my list, and it's amazing. Q. What other regions are you excited about? A. The Loire Valley is one of those places that hits that sweet spot where nothing comes in over $40 [in stores], white or red. Plus, there are a lot of cool producers in the Loire like Puzelat-Bonhomme and Bellivière working with Pinot Noir and Gamay, not just Cabernet Franc. And Sicily—a decade ago everyone was focusing on imported varieties like Cabernet and Chardonnay. But now Sicily has all these small producers, like Valle dell'Acate and Arianna Occhipinti, concentrating on local varieties like Albanello and Frappato. Some of these wines can be incredible values. Q. Isn't there a fashion right now, though, for putting obscure wines on restaurant lists just because they're obscure? How many Frappatos can you offer before the customer gets annoyed? A. If you're a sommelier, I don't think it's either smart or nice to make a wine list that's entirely about wines you like personally. What's the point if someone has to have a decoder ring to figure out what's on your list? I definitely have obscure wines on my list, but I also have a great Pinot Grigio from Tramin by the glass. I want people to walk in and feel comfortable; I don't want to challenge them for no reason. Q. One thing you feature is a lot of older vintages at surprisingly low prices. What has the response been like? A. The funny thing is, when people think they've found something priced wrong on the wine list—too low—they get really excited. They feel like they put something over on me. They're really thrilled because they feel like they're getting away with something, like a '96 Nuits-St-Georges from Freddie Mugnier that we sold for $125. I offer stuff like that at an incredibly low markup. Q. If you were going to pour a wine for anyone in the world, who would it be, and why? A. David Lynch, the director. First, because I've always admired his films and art, and second, because it'd be awesome! I think I'd saber a bottle of Champagne for him. Or, I don't know—he seems like a Bordeaux guy, so maybe an exquisitely old Bordeaux instead. One of my all-time favorites is the '89 Château Haut-Brion. Q. So tell me—do you still have a skateboard? A. I do! The last board I actually ever rode regularly is mounted on the wall of my apartment. But I turned 41 a few months back, and it's a little harder now. I definitely wouldn't want to be videotaped doing it.